Bid adjustments allow advertisers to raise or lower their bid when ads are served to a certain audience or in a particular format. You can use coefficients to adjust your bid. A coefficient is the percentage by which you want to change the bid. How do bid adjustments work? Bid can be adjusted for a particular audience or display format. For example, you can use them to target users who have already ordered items from your site. When an ad is served to this type of user, your bid will automatically change according to the coefficient you set. That way, adjustments will bring in more traffic than you would have gotten based on your initial bid. Target audience — increase or decrease for an audience that matches certain retargeting list conditions. Mobile — increase or decrease for ads on mobile phones and smartphones. Gender and age — increase or decrease for an audience of a particular gender or age. Video extensions — increase or decrease for video extensions. Smart ads — increase or decrease for smart ads. Only for smart banners. Devices — increase or decrease for different types of devices. Available only for banner display campaigns. Inventory — increase or decrease for different types of display advertising. Available only for video display campaigns. 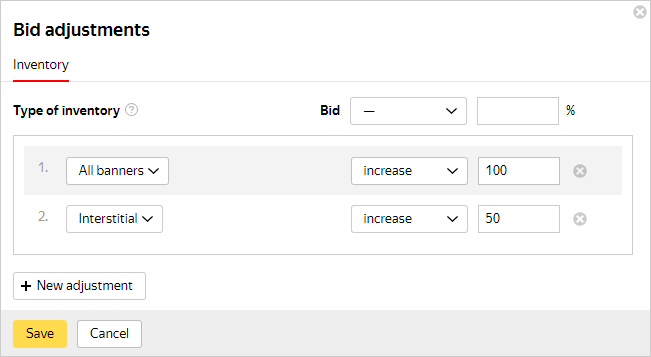 You can adjust bids for a particular campaign or ad group. 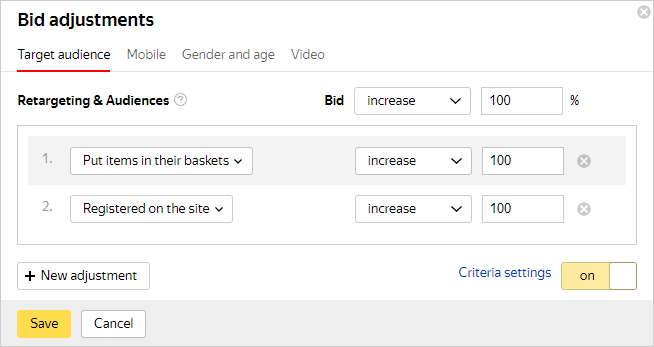 If you use the same type of bid adjustment on the level of both a campaign and an ad group within it, then the group-level adjustment will be used. If you don't want to apply bid adjustments to a certain ad group within a campaign, set the coefficient for that group to zero. For example, let's say you set the coefficient to “increase by 40%” for a particular campaign, but don't want this coefficient to apply to a particular ad group. For that group, you would set the coefficient to “0%”. When you use automatic strategies, Yandex.Direct factors coefficients into its bids and does not exceed the limits you set for your weekly budget or average CPC. If you set a maximum bid for a strategy, the actual bid will not exceed the adjusted maximum. For example, you're using an automatic strategy. Your maximum bid is set at 20 rubles per click and your coefficient for mobile impressions is set to “increase by 100%” (so that the adjusted bid will be 40 rubles). In this case, impressions on mobile devices will display at the 40 ruble bid rate. You can apply several adjustments to a given bid (for mobile impressions, by gender and age, by display region by time of day, etc.). Adjustments are applied in succession (they are not added together). For Moscow and the surrounding area — “increase by 200%”, in other words 100% + 200% = 300% of the bid (the bid × 3). To make an adjustment, go to the ad group editing page or campaign settings page and click Change in the Bid adjustments section. You can set bid adjustments for certain retargeting lists. For example, let's say some users on your site put items in their shopping carts but did not end up purchasing them. You can add an adjustment based on the “Put items in their cart” condition and set a raised coefficient. This way you'll increase the probability of reaching an audience that's interested in your product. Select a retargeting list and set a coefficient. Add up to 100 adjustments using the New adjustment button. You can assign the same coefficient for all adjustments in the Bid field above the adjustment list. To add a new target audience, click Criteria settings. Any retargeting list can be used for bid adjustments, even ones consisting only of unfulfilled goals. Learn more about how to add retargeting lists. The minimum bid (including the coefficient) for a target audience is 100% less than the original bid. This will disable impressions. The maximum bid is equal to the original bid plus 1200%. For example, if the bid for a keyword is 40 rubles, the maximum possible bid would be 520 rubles. Please note that sometimes users may be served ads based on retargeting lists that you disabled using bid adjustments (i.e. you set a "decrease by 100%" coefficient). Switch the option to the position if you want to temporarily enable or disable all adjustments. Click next to any adjustment that you want to permanently delete. The bid including the coefficient cannot be less than the minimum value for your currency. You can experiment with bid adjustments in order to get the desired number of click-throughs from mobile phones and smartphones. You can't completely disable impressions on any particular type of device. Choose increase or decrease and set the coefficient. The minimum bid for impressions on mobile devices with a coefficient is 50% less than the original bid. The maximum bid is equal to the original bid plus 1200%. For example, if the bid for a keyword is 40 rubles, the lowest possible bid would be 20 rubles, and the maximum bid would be 520 rubles. How a coefficient works depends on the device type. Even if the user is on the regular version of Yandex on their mobile phone, the mobile bid rate will apply for impressions. For click-throughs from tablets, the computer bid rate applies. In order to disable the adjustment, delete the coefficient. 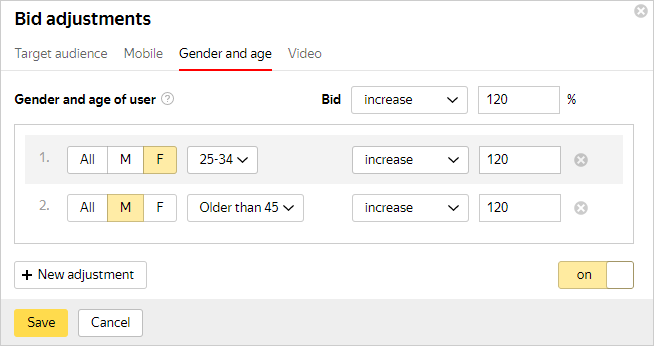 If your target audience consists of users of one gender or age group, then you should use bid adjustment along these parameters. You can use cross-sections of gender and age statistics found in the Report Wizard, as well as demographic reports from Yandex.Metrica to help determine your audience makeup. For example, say almost all buyers of cosmetics from your internet store are women around 30 years of age. You can set your gender and age criteria and apply an “increase by 120%” coefficient in order to ensure that your ads display more frequently in favorable positions to women between 25-34. Choose your target gender and age and set the coefficient. Add up to 12 adjustments using the New adjustment button. You can assign the same coefficient for all adjustments in the Bid field above the adjustment list. The All field includes men, women, and users whose gender could not be determined. The Any field includes users of all ages including those whose age could not be determined. Please note that ads may sometimes be served to those users that you have excluded through adjustments for age and gender. You can experiment with bid adjustments in order to get the desired number of click-throughs from video extensions. It is not possible to completely disable impressions for video extensions. The minimum bid for ads with video extensions with a coefficient is 50% less than the original bid. The maximum bid is equal to the original bid plus 1200%. To disable bid adjustments, enter a coefficient of “0%” or delete the value. 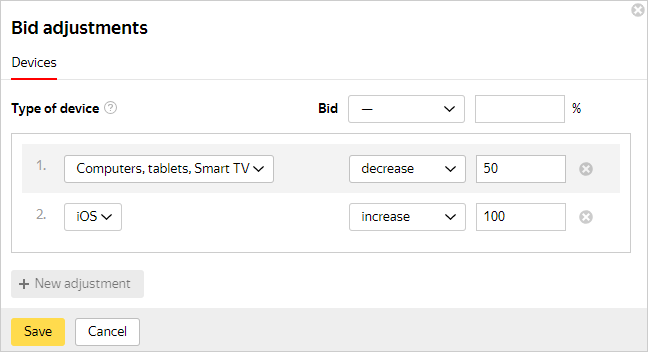 You can set a bid adjustment for smart ads (individual ads for products that are part of a “Smart banner” campaign). The adjustment will not apply to your bids for other smart banner templates. The minimum bid with a coefficient is 80% less than the original bid. The maximum bid is equal to the original bid plus 1200%. For example, if the bid for a filter is 40 RUB, the lowest possible bid would be 8 RUB, while the maximum bid would be 520 RUB. You can set bid adjustments for impressions on different types of devices. To find out which devices users are on when they engage with your ads or open your site, use the Device type segment in the Report Wizard and the “Technologies — Devices” report in Yandex.Metrica. Bid adjustments only apply to display campaigns. smartphones — only on iOS, only on Android, or on all smartphones (iOS, Android, Windows, and others). other devices — this includes desktop computers and laptops, tablets, Smart TVs, and other devices. The minimum adjusted bid is 100% less than the base bid. The maximum adjusted bid is 1200% more than the base bid. You can decrease the bid by 100% in order to exclude impressions for the selected type of device. However, you can't decrease the bid by 100% for all types of devices at once. For example, if the bid for a keyword is 40 rubles, the lowest possible bid would be 0 rubles, and the maximum bid would be 520 rubles. interstitial - video ads played back in mobile apps before download or change of content. The minimum adjusted bid is 100% less than the set bid. The maximum adjusted bid is 1200% more than the set bid. You can decrease the bid by 100% in order to exclude impressions for the selected type of inventory. However, you can't decrease the bid by 100% for all types of inventory at once.